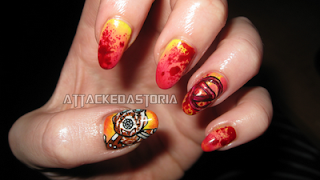 Attackedastoria Nails: Borderlands 2 nails! Hey guys! Any Borderlands 2 fans out there? I was a huge fan of Borderlands after my boyfriend got me into it, so I was super stoked when the second one came out recently.. I'm doing my first playthrough with Maya(the siren) and it's awesome. Anyway.. I took this from the cover, obviously. I wanted to do more, but after the psycho, I was pretty impatient, haha. Still pretty happy with them! Probably the most ambitious thing I've done in a while. Oh Lex these look neat! I played the first one for a bit, but the love is into the game. I did start a new character haha and I picked the Siren as well. I haven't played much of it though. It's only on level 4 right now lol. Haha I've been playing it as much as I can since the actual second that it was released. Gunzerker is WIN!